Home » animal » hybrid » wholphin » A Wholphin actually exists. It is half whale half dolphin. 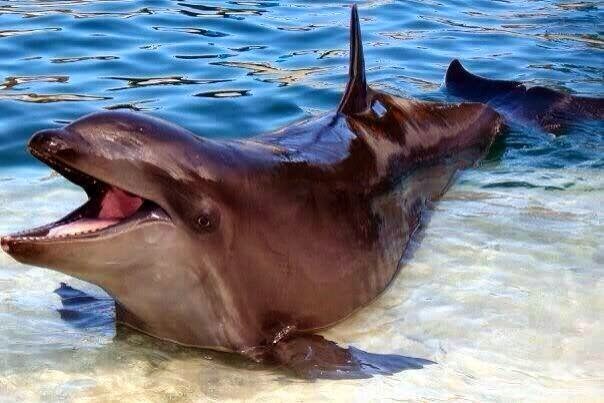 A Wholphin actually exists. It is half whale half dolphin. A wholphin or wolphin is an extremely rare hybrid born from a mating of a female bottlenose dolphin (Tursiops truncatus) with a malefalse killer whale (Pseudorca crassidens). The name implies a hybrid of whale and dolphin, although taxonomically, both are within the "oceanic dolphin" family, which is within the "toothed whale" suborder. The first recorded wholphin was born in a Tokyo SeaWorld, but he died after 200 days. The first wholphin in the United States and the first to survive was Kekaimalu, born at Sea Life Park in Hawaii on May 15, 1986; her name means "from the peaceful ocean". Although they have been reported to exist in the wild, only one is currently in captivity, at Sea Life Park in Hawaii. Kekaimalu proved fertile when she gave birth at a very young age. The calf died after a few days. However, in 1991, Kekaimalu gave birth once again, to daughter Pohaikealoha. For two years, she cared for the calf, but did not nurse it; it was hand-reared by trainers. Pohaikealoha died at age 9. On December 23, 2004, Kekaimalu had her third calf, daughter Kawili Kai, sired by a male bottlenose. This calf did nurse and was very playful. Only months after birth, it was the size of a one-year-old bottlenose dolphin. All three calves were three-quarters bottlenose dolphin and one-quarter false killer whale.Both Kekaimalu and Kawili Kai remain in captivity, and are now part of the normal tour at Sea Life Park. In one episode of the show The Million Pound Drop Live, a team was asked which hybrid did not exist: a wholphin, a zorse, a liger, and a sheepig; they bet £550,000 on the wholphin and £150,000 on the sheepig. As the wholphin was real, they lost £550k of their money but later said that Mangalitsas are commonly referred to as sheepigs. [The] 'wolphin' and 'Shetbra' are two examples of rare hybrids created when animals have mated across the species divide. Kekaimalu the 'wolphin' was the result of the union of a bottlenose dolphin and a false killer whale, which is actually a member of the dolphin family. The two parent animals mated while working together at Sea Life Park in Hawaii and Kekaimalu was born in 1985. Her size - 600lbs and nearly 10ft long - colour, and shape are half way between that of her mother and father. Perhaps even stranger is Nikita the 'Shetbra', the offspring of a Shetland pony called Linda and a zebra called Jonny in 2004. They lived on a farm in Mongenzon, in north east South Africa, where Jonny learned to jump a fence between their enclosures. The result was Nikita, who was born less than 50cm high, with very short legs, an unusually large head, delicate pointed hooves and stripes like her father. The world's only known whale-dolphin mix has given birth to a playful female calf, officials at Sea Life Park Hawaii said Thursday. The calf was born on Dec. 23 to Kekaimalu, a mix of a false killer whale and an Atlantic bottlenose dolphin. Park officials said they waited to announce the birth until now because of recent changes in ownership and operations at the park. The young as-yet unnamed wholphin is one-fourth false killer whale and three-fourths Atlantic bottlenose dolphin. Her slick skin is an even blend of a dolphin's light gray and the black coloring of a false killer whale. The calf still depends fully on her mother's milk, but sometimes snatches frozen capelin from the hands of trainers, then toys with the sardine-like fish. She is jumbo-sized compared to purebred dolphins, and is already the size of a one-year-old bottlenose. "Mother and calf are doing very well," said Dr. Renato Lenzi, general manager of Sea Life Park by Dolphin Discovery. "We are monitoring them very closely to ensure the best care for them." Although false killer whales and Atlantic bottlenose dolphins are different species, they are classified within the same family by scientists. "They are not that far apart in terms of taxonomy," said Louis Herman, a leading expert in the study of marine mammals. There have been reports of wholphins in the wild, he said. Kekaimalu, whose name means "from the peaceful ocean," was born 19 years ago after a surprise coupling between a 14-foot, 2,000-pound false killer whale and a 6- foot, 400-pound dolphin. The animals were the leads in the park's popular tourist water show, featured in the Adam Sandler movie "50 First Dates." Kekaimalu has given birth to two other calves. One lived for nine years and the other, born when Kekaimalu was very young, died a few days after birth. Park researchers suspect the wholphin's father is an 8-foot long Atlantic bottlenose dolphin named Mikioi. "He seems to be totally oblivious to this happening," Lenzi said. False killer whales do not closely resemble killer whales. They grow to 20 feet, weigh up to two tons and have a tapering, rounded snout that overhangs their toothed jaw. Atlantic bottlenose dolphins reach a maximum size of 12 feet and can weigh up to 700 pounds. Sea Life Park officials said they hope to decide on a name for the baby wholphin soon and move her to a large display tank in a few months.